Happy Thursday everyone! 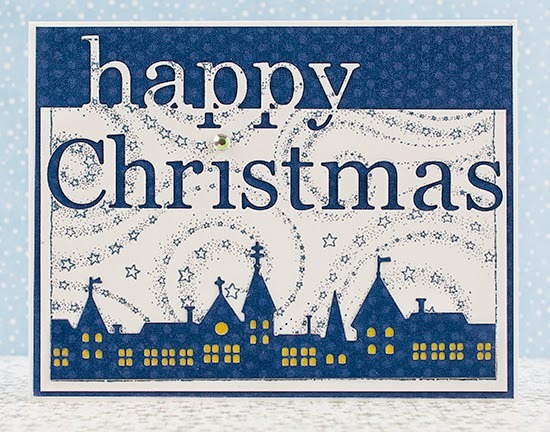 Robin here with a Christmas inspiration card for Dies R Us! The holiday are definitely upon us, no stopping them now! So, could you use a few quick cards?Well, this design is for you! Using just two dies you can put together this card in no time! I started with a white cardstock and used an all over stamp to create my background. 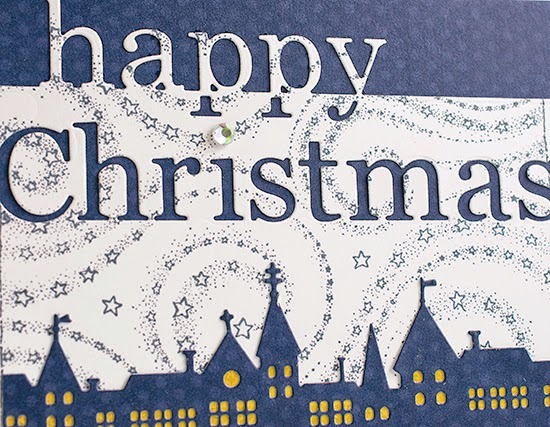 I cut out the Memory Box Grand Happy Christmas from my background and layered it onto a tone on tone dark blue polka dot paper. I then cut the village from the same blue cardstock using Impression Obsession's Town Scene die; I backed the die cut with yellow paper and added to the front of my card. To finish my card I added a gem stone to "dot" the i in Christmas! Don't forget to sometimes keep it simple and take some stress out of your life! Take a look at the Dies R Us Blog for some great inspiration from our amazing design team members. Then head on over to our store, Dies R Us, pick up a few dies and you are ready to get to town on your holiday cards! Shipping is FREE with a $35 purchase! This is darling! What a clever way to use the sentiment too! I absolutely love it at the top of the card instead of the bottom!